Are you looking for a knife that will carry you through every hunting season, every fishing season, and in every outdoor condition? Well, look no further with Opinel Knives! These knives are built to take you there without any worry. At a great price point, you don’t want to miss out on this deal! With a blade coming in at 3.94 inches, it is hearty and delicate enough to handle large cuts on game and small cuts for any of your needs. The blade is made up of Sandvik stainless steel, which gives the blade a rock solid and rugged design. This blade is anti-corrosive because of its chrome design, and features a .40% carbon content with an excellent cutting edge. 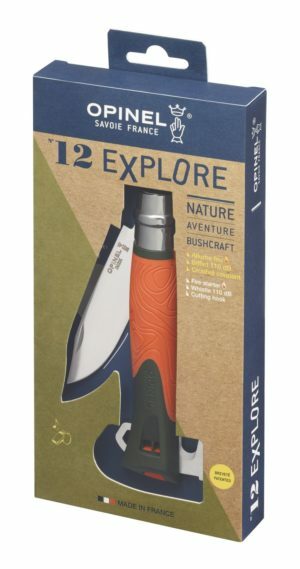 The Explore is not only a knife, it is a survival tool. With its functional design the knife’s handle contains a variety of different tools you need. The handle has a built in fire starter works in whatever weather condition you may be in. Included in the knife’s handle is a whistle for emergencies as well as a cutting hook feature that helps with any of your hunting or fishing needs. The handle is made out of a fiberglass-reinforced polyamide that can withstand shocks, humidity, and extreme temperatures from -40 degrees to 176 degrees fahrenheit. Included in the knife is a Virobloc safety ring, which is fitted to all folding knives in the Opinel line. This feature was invented by Marcel Opinel in 1955 and has been a staple in safety and efficiency in the Opinel knife line. 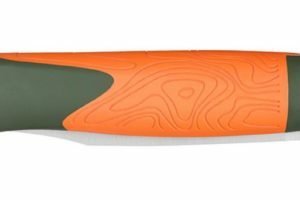 If you are looking for a great outdoor tool for either yourself or just a gift for a friend, this is the knife for you. The N 12 Explore knife comes in two sets of colors and also has an engraving feature for you to personalize each knife you purchase! 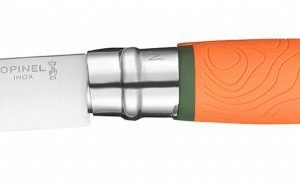 Opinel also offers a great line of hunting and kitchen knives that every outdoor enthusiast must check out!